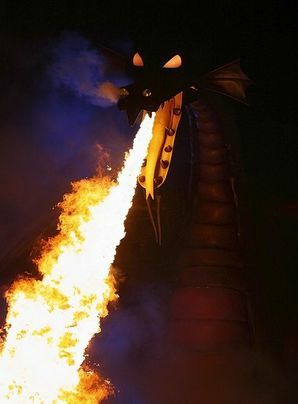 The Fire Breathing Dragon is an unoriginal yet deadly monster of Godville. As we all know, caves are useful to have. You can store junk, old tattered clothes, or live in them. The problem is when you come along after a long quest and what do you know, a dragon is in there, spilling magic and breathing fire all over the place, and generally making a burnt mess out of the stored kegs of beer you had reserved for a party with that nice daughter of the trader. So, get thee to fighting! Stay out of the way of its mouth and tongue area, as Fire Breathing Dragons have been known to burn the candle at both ends, from 1000 meters away with accuracy. Likes to hang out with: Little Johnny Paper, and a donkey named Donkey. Origin (rumored): A land called Honna Lee. This page was last edited on 12 March 2019, at 01:12.